Bath time can be incredibly uncomfortable for toddlers. Harsh irritants can seep into your precious tot’s eyes causing pain. Toddler’s skin may also be more sensitive at such a young age and may not be ready for an adult strength. The new Dial Kids body + hair wash for ages 2-5, has been specially formulated to provide ultra gentle cleansing. The peachy clean scent smells utterly delicious! Not too overwhelming for your little one and gentle on the skin. Your children will also enjoy the adorable picture of a whale and giggling tots on the bottle. The bottle is see-through so that you can view its contents which are also clear. This product provides adequate suds to cleanse your little ones skin or hair. Water, Sodium Laureth Sulfate, Cocamidopropyl Beltaine, Glycerin, Fragrance, Polyquaternium-7, Peg-120 Methyl Glucose Dioleate, Peg-7, Glyceryl Cocoate, Peg-200 Hydrogenated Glyceryl Palmate, Polysorbate 20, Tetrasodium EDTA, Sodium Benzoate, Citric Acid, Sodium Chloride. Developed with Pediatric Dermatologists for kids’ perfect skin. Your children may be getting to the “I don’t want to take a bath!” stage. Trust me, this lasts into the teenage years as well. To make bath time more fun for them, I allow them to have their own special body wash, and hair products. It gives them more control and they feel “grown up” by having something all to themselves. This all in one product is a great way to save money and still give them what they want. 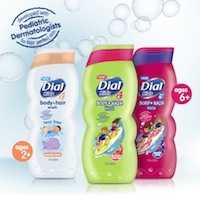 Dial Kids body + hair wash for ages 6+ is a mild cleansing product that helps protect skin from drying out. The Watermelon and Berry Cool scents smell amazing! To be honest with you, I wouldn’t mind using these products myself. The Watermelon hair and body wash is in a lime green bottle with a picture of children surfing on the front. The Berry cool hair and body was is in a pink bottle with the same picture on the front. This product provides adequate suds to cleanse your little ones skin or hair. Disclaimer: I received a sample of Dial Kids body + hair wash in exchange for sharing about these products with me readers. All opinions are my own.